Boston Police report arresting Abdirahman Abdi, 25, of Brockton, on charges he shot another man during a robbery at Columbus Avenue and Ritchie Street around 8:45 p.m. on Tuesday. Read more. City Councilor Kim Janey (Roxbury) reports on a big problem for the residents of the 202 apartments at Academy Homes along Columbus Avenue: Read more. Boston firefighters responded around 8:50 p.m. to 279 Centre St. for a fire in an apartment on the fourth floor of an eight-story Hailey Apartments building. The sprinklers turned on and firefighters were able to quickly knock down the fire. 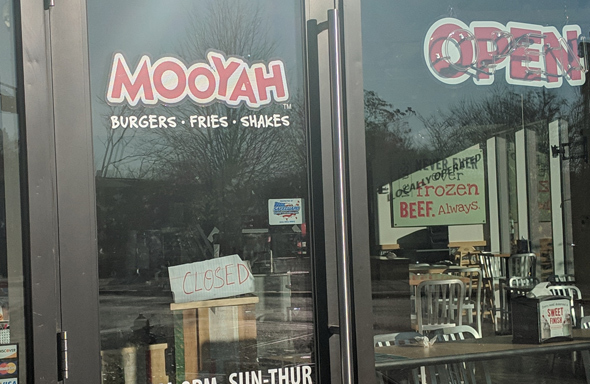 Mooyah, next to the Jackson Square T stop, looks to be an Ex-yah now. Not only was it closed this afternoon, it's been stricken from the Mooyah Web site. The outlet opened a little more than a year ago, several months after the second Grass Fed, in Forest Hills, closed. The original Grass Fed, on Centre Street, got a new owner, but has itself been closed for several months. 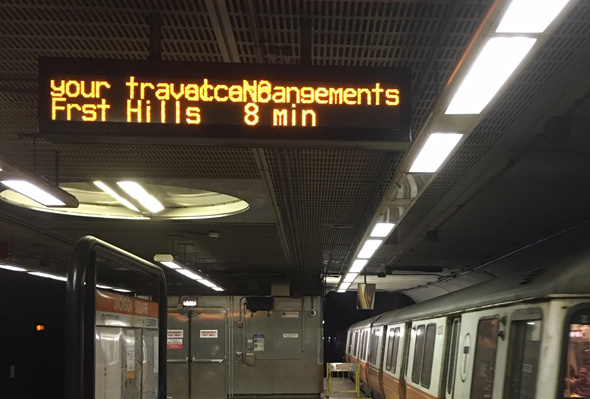 Orange Line sign struggles to tell riders something, but what? Jed Hresko captured this sign at Jackson Square this evening. Was it frustrated at all the attention area highway signs are getting, but just couldn't sum it all up in 40 characters? Boston and Transit Police are investigating how a man wound up stabbed and on an inbound Orange Line train that pulled into Back Bay around 10 p.m. The man was stabbed at 10 Atherton St. in Egleston Square, then walked to Jackson Square - where he got on the T.
Boston Police report arresting Wilvin Guity, 28, of Dorchester, on charges he murdered both Chris Joyce and Clayborn Blair in the rear of 277 Centre St. on May 4. Read more. Boston Police have identified the second man shot to death at the Mildred Hailey Apartments on Friday night as Clayborn Blair, 58. Two men were shot, one in the head, around 9:40 p.m. behind 277 Centre St., midway between the T stop and Bickford Street. Read more. Ritcher Baez, 25, of New York City, today admitted he killed Pippin Roe near a Jackson Square construction site in 2014, then left her body under some leaves and debris, the Suffolk County District Attorney's office reports. The MBTA reports it's replacing Orange Line trains with buses between Ruggles and Forest Hills due to a problem with the tracks at Jackson Square. If Ronaldo Cepeda wants to appeal his indictment on second-degree murder charges for the stabbing death of Mason Raymond in 2015, he'll have to wait until after his trial, if he's found guilty, the Supreme Judicial Court ruled today. Read more. "Minor" delays inbound, the MBTA says. Around 7:15 p.m. at Centre Street across from Wise Street, Boston EMS Incidents and NBC Boston report. The Board of Appeals today approved a 44-unit apartment building on Amory Street in Jackson Square that will have some units priced low enough for people making under $35,000 a year to afford. Read more.